Learn to hand-embroider with The Stitchery. The Stitchery was founded in 2017 by Nicki Franklin of The Little Green Door. The first subscription began in January with a 12-month project of seasonal embroidery patterns aimed at beginners and advanced stitchers alike. The stitching community built rapidly on social media with instagrammers sharing their work via the hashtag #thestitcheryjournal ; it was amazing to see real online friendships forged across the world by a common desire to learn to stitch and carve out a little quiet time for oneself. For 2019, I am pleased to offer two subscription options. 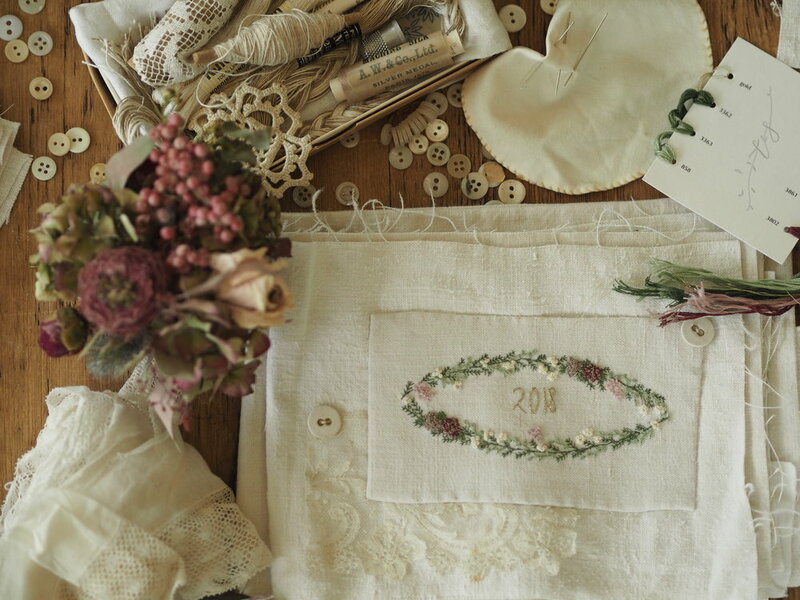 Inspired by my love of words, typography and antique monograms, the 2019 monthly subscription will be an A-Z needlework sampler. I am also an avid reader and have always loved a hardback storybook with illuminated letters. I would often decorate the first letter of the stories and correspondence that I wrote as a child. The combination of lettering and drawing fascinates me and so working with Kate Nicole of Oyster Bridge & Co this year has been such a privilege. Kate’s delicate lettering and scrollwork has no doubt been influenced by the beautiful antique French documents, magazines and books that her family has sourced for more than 20 years. With its refined, almost ethereal beauty, I have found Kate’s work and her guidance hugely inspiring. I wanted the subscription next year to be a little more challenging for the stitchers taking part and feedback from the journal suggested that my subscribers would like to have something they can frame and show off, having worked so hard on their needlework skills. With this in mind I have created an A-Z sampler. Kate Nicole has provided the artwork, illustrations and lettering for the packaging. It is super gorgeous. In month one you will receive the backing linen printed with the full sampler pattern outlines together with the thread, patterns and instructions for three letters. Each month thereafter you will receive another two or three letter patterns to stitch together with the threads and full size pattern for you to use for other pieces of work afterwards. Perhaps you would like to monogram a pair of pillowcases as a gift or work a ‘welcome’ sign for your home. Each letter works beautifully together and although they are decorated with differing flowers and stitches the whole pattern is perfectly harmonious. This year I provided youtube tutorials for the first few months to share the detail of the stitches; this will be something that I do every month with the Stitchery Sampler to share how to work the letters but it will be subscriber content only. There has been a real community of stitchers this year and I am keen to help share this and widen the community next year with fun online webinars for stitchers and gatherings across the country for those who would like to meet their stitchery friends in person. This is all included within the cost of the subscription. Subscribers can also expect other additional patterns and suprises in the boxes. There will be a ‘mini stitch’ to keep you busy each month including floral motifs each quarter. At the end of the year subscribers will also receive the pattern for an A-Z of lower case letters and numbers, to complete the collection and enable stitchers to design their own work going forward. To enable me to gauge interest, I am selling the first month of the subscription as a one-off now with a view to setting up the subscriber button in January for the months of February to December. You can buy your first subscription and reserve a place in the project by purchasing here. There is also the option to buy a year’s subscription in full at a discounted price; this is a great idea for Christmas presents and you can find more information here. I hope you can join us for another happy year of stitching, friendship and inspiration.